It was our son-in-law Doug’s birthday last week. I had told him that I would make him a dessert for his birthday. Doug loves peanut butter, so he requested something with peanut butter. 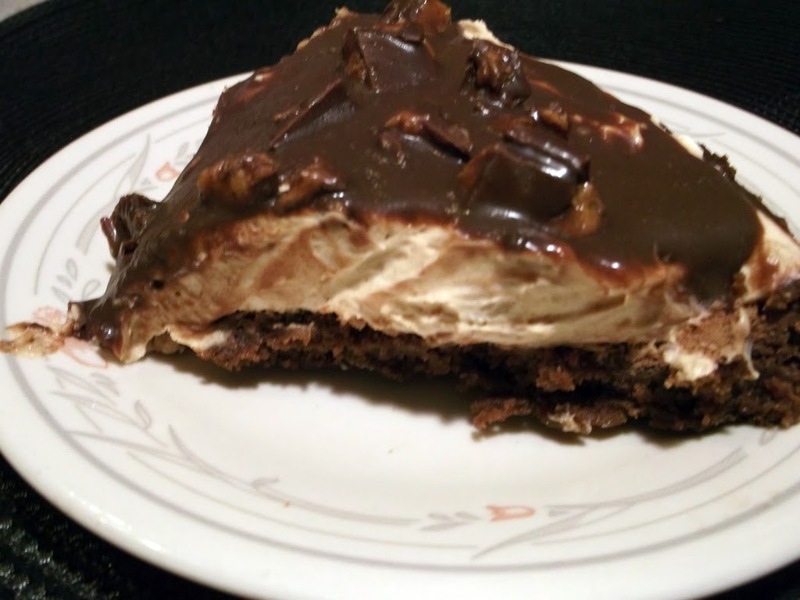 I make a peanut butter pie that everybody loves and I have even posted about it. So I set out to find something that would be fit for Doug’s birthday dessert. I decided to stay with some kind of peanut butter pie, but I didn’t want to make a large cake and have a lot of leftovers. I found the recipe that I wanted to make on What Were Eating. When I saw the title for this recipe I knew it would be the one that I would make. 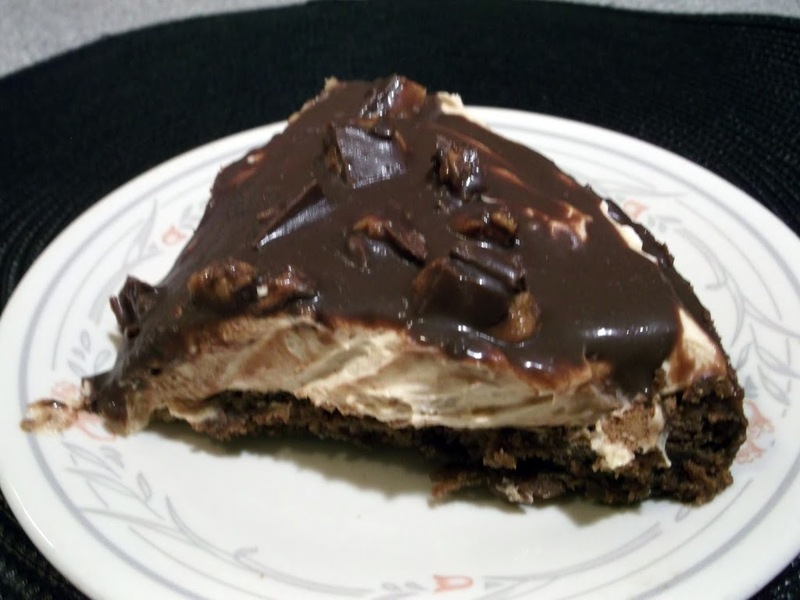 The title of the recipe is Killer Peanut Butter Chocolate Pie. Doesn’t that sound wonderful! With a name like this I knew that it would fit for a birthday dessert. This is not your typical pie with a crust and a filling, but it worked for me. 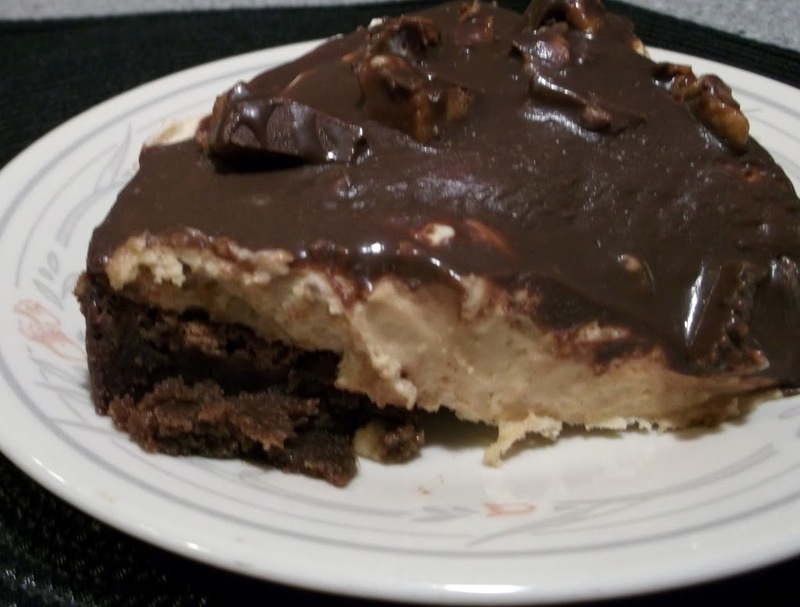 The bottom of the pie is a dense chocolaty brownie. Then you have a peanut butter mousse in the middle, which is heavenly. On top of all this you have chopped up peanut butter cups covered with a ganache. Needless to say it was a total hit. So if you are looking for a dessert that is sure to impress everyone that eats it I would suggest this dessert. The name really does say it all Killer Peanut Butter Chocolate Pie. You will think you died and went to dessert heaven.I apologize for my pictures. I waited to take pictures to last piece of dessert was left. That was not a good thing to do. Preheat oven to 350 degrees F. Line the bottom of a round 9″ cake pan. Spray the side of the pan with cooking spray and flour. Place the butter and the chocolate in the microwave and heat until melted. (I took it out every 20 seconds to stir) for about 45 to 60 seconds. Cool slightly. Add the eggs to a mixing bowl and beat slightly. Next add the vanilla, salt, sugar, and brown sugar to the bowl, whisk all together. Add the chocolate butter mixture then whisk again. Gently fold in the flour to the brownie batter until just combined. Over mixing will result in tough brownies. Pour the batter into the prepared cake pan. Place into a preheated 350 degree F oven. Bake 20-25 minutes or until done. Remove from oven and cool completely on a wire rack, at least an hour. To remove from pan, carefully slid a knife around the edge to loosen the edge of the brownie. Place a plate over the brownies then invert the pan. While the brownies are baking/cooling prepare the mousse. Place the peanut butter, cream cheese, vanilla, and milk into a large mixing bowl. Beat with an electric mixer until smooth and fluffy. Add the powdered sugar. Beat until smooth. Set aside. Place whipping cream into a separate mixing bowl. Beat until whipped cream holds stiff peaks. Working in four batches, gently fold the whipped cream into the peanut butter mixture to form a light airy mousse. Over working the mousse will cause the whipped cream to deflate so use a light hand. Chill mousse in the fridge for about an hour. Carefully place the brownie onto a plate you wish to serve the pie on. Remove the mousse from the fridge. Gently spread the mousse over the brownie, with a spatula smooth out the top surface of the mousse. Place the brownie and mousse into the refrigerator. Chill for about 30 minutes before finishing. Remove the pie from the refrigerator. Sprinkle the chopped Reese’s cups evenly over the top of the pie. Drizzle with ganache. This pie must be served chilled or the mousse will deflate. Pie may be stored in the refrigerator for up to 3 days. It freezes well and can also be eaten straight from the freezer. (Note I made my pie in a spring form pan and left in the pan. The pie was traveling so it was easier to transport in this pan. It was easy to serve from the spring form pan as well). Dark chocolate and peanut butter makes me weak in the knees! Could this get any more decadent? I just love the brownie bottom, this is going to the top of my must make desserts. Great post! Oh, my gosh….this is pure decadence!!! LOVE it! Oh my! This one has me drooling.